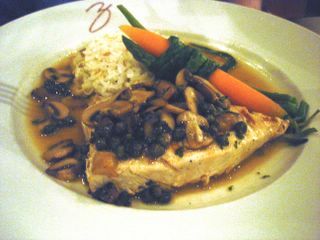 One the Eve of Christmas Eve, December 23rd, we tried Zov's Bistro for the first time. It was a trip long overdue, considering that it earned multiple votes in a recent "Ultimate" Orange County poll on Chowhound. Not only that, Mealcentric wrote up a review of his first experience there the very same week, proclaiming it as his new favorite restaurant. This just about cinched it for me. So off to Tustin and Zov's we went, a scant seven miles from home. As we walked up to Zov's building, we discovered that it is split into two parts; on one side the bakery/cafe and on the flip side facing a second parking lot, the bistro. This was where everyone was that evening. The majority of the diners braved the cold crisp air by eating outside, under an elegant tarp that seems to be a permanent fixture of the restaurant, like an never-ending wedding reception, complete with dangling chandeliers. 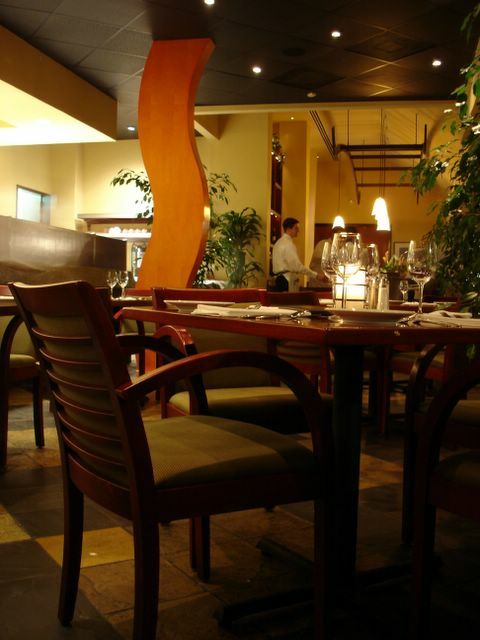 Each table was kept toasty by radiative heaters hovering overhead. Not feeling like dining under a Ronco rotisserie, where our waitress could conceivably "set it and forget it," we opted for the dining room and sat near the open kitchen. It's always a treat to see your food being prepared in front of you, especially in such a frenetic and dynamic environment as this kitchen was. Eventhough Zov, herself, wasn't there that night, she left the cooking to a cadre of capable young male chefs. We watched these guys work as we nibbled on warm rolls slathered in butter, marveling on how pillowy soft the interior was compared to crackling crisp crust. In this cozy dining room, a column undulates into an snaky "s", recalling 80's modernism, while the tables remain naked, made of a polished teak veneer that gleamed like mirrors. We skipped the appetizers and ordered our entrees. 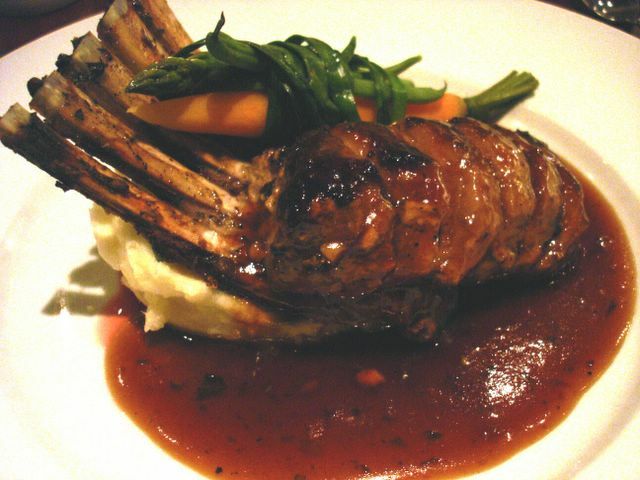 I zeroed in on the Roasted Rack of Lamb ($27.95), which were actually lamb medallions, splayed out in thick rare slices on top of whipped potatoes. The charred bones from whence the meat came were driven into the same mound of spuds upright, like skis. I dug into the glistening slices of the sheep steak and immediately noticed the lack of gaminess I've come to expect from lamb. Instead it was beefy, silky, and fork tender, like a premium filet mignon with a clean finish. The pool of pomegranate and garlic reduction on the plate was just the thing to round out the flavor. I pushed around each forkful of the lamb in this dark burgundy sauce; a fruity sweet syrup with a bitingly sour tang. Imagine cranberry sauce boiled down and concentrated to its berry core, then kissed by garlic. Presented as both a garnish and accompaniment were steamed haricot verts, asparagus and a single carrot, tied tightly in a bundle by a wilted green onion stalk. "Look! A vegetable straight-jacket!" I said. It was a creative and whimsical presentation, although the carrot was slightly undercooked. By far the best part of this dish were those sooty bones, which I promptly split apart like pork ribs once I finished the medallions. I gnawed on them like a rabid jackal, tearing off every last remaining shred of that sweet meat. The Seafood Tagine ($24.95) was a take on cioppino, that Italian/San Franciscan tomato and seafood soup which is densely populated with mussels, clams, and prawns. For this rendition, the chef added a distinctly Middle Eastern touch; seabass wrapped with grape leaves and toasted couscous. The seabass "cigars" were firm and flaky, rolled in sturdy grape leaves to protect the fish from breaking apart in the broth. The couscous which reminded me of pellet-sized tapioca pearls, functioned much like pasta, adding a slippery and starchy component to the dish. 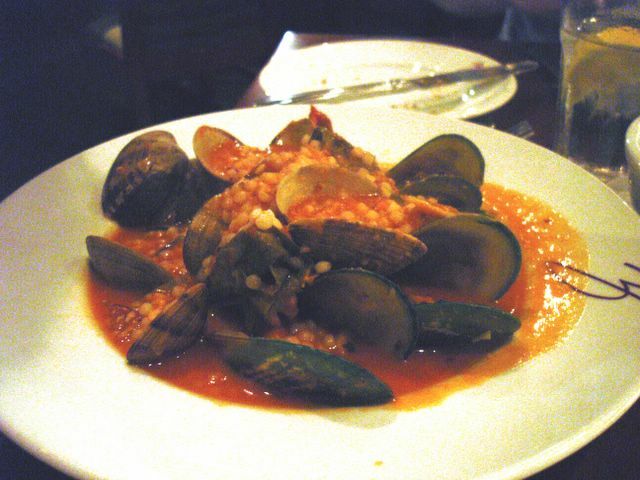 The fresh mussels and clams sparkled in the powerful peppery punch of the tomato broth, which complimented the seafood rather than overwhelmed. But the shrimp, giants the size of thumbs, were, I'm sorry to say, rubbery and overcooked. I tried a small bite of the Grilled Swordfish Piccata ($24.95) and it was good. Served with a delicate sauce of white wine, shallots, capers, mushrooms, and lemon, this had the lightest touch of the three dishes we ordered. To close out our dinner, we chose the Bread Pudding ($8.50) to share between the three of us. 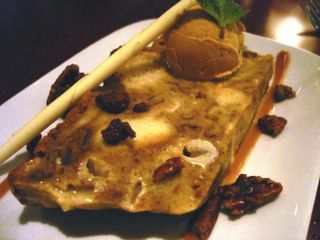 Candied walnuts were strewn about for crunch and served as a textural contrast to the bread pudding. But pudding this ain't. Rather, as others have described, it bears more resemblance to a dense, moist slab of cake. It's served as a slice, cut from a bigger loaf, topped with a scoop of pumpkin ice cream and a white chocolate straw. It gets top marks in my scoresheet for presentation, but unfortunately not for taste. After the first bite, I yearned for the soppy, warm, wet, and mouth-filling simplicity of the traditional preparation. However, my friends weren't as picky as I was, and liked it nonetheless. We all agreed that we liked how the pumpkin ice cream run-off turned into a thick decadent sauce for the "cake." Apart from that dessert, which can just be chalked up to personal preference, Zov's lived up to my expectations and has convinced me that Tustin is one of Orange County's best food towns. Hi Elmo - Nice meal! I love the "Ronco" line.....Hope your Holidays are going well. Happy New Year! Thanks Kirk! Warm wishes to you and yours as well! "it was beefy, silky, and fork tender, like a premium filet mignon with a clean finish. " As to the bread pudding, I can see how it didnt satisfy you. I am a total bread pudding freak and Zovs version can be a total let down if you are expecting a traditional bread pudding. But give it any other name so that your expectations arent skewed, and it was a great dessert. I just loved how the ice cream would melt and saturate the bread and mix in with the caramel sauce. Also, I paid a visit to the cafe side of Zovs a week or two ago. Service was great and the food was very good, but prices were steep for the portion size. I was a little let down nd I dont see it becoming my favorite lunch spot. Sounds like a delicious and extravagant meal! It seems like you ordered the best dish of the three. Also, pumpkin ice cream and bread pudding? Interesting combination! It seems that Zov's was an excellent way to celebrate Christmas Eve. (Can't wait to see where you on New Year's Eve!) Have a wonderful New Year! "Bone chaser!" Why didn't I think of that! Nicely put...and true that if that bread pudding was called something else, I probably would have loved it more. It was a good dessert by any other name. Went to my favorite restaurant of all this New Year's Eve; Cafe Hiro, and I took photos, so I'll be writing about it (AGAIN) soon. Elmo, one thing i enjoy about your reviews is the gourmet dishes you choose to devour and photograph. It inspires me to improve my presentation in cooking... so don't be surprised if my dishes look similar haha. happy new year. we should all discuss some kind of meetup this month since prof. salt's initial luncheon has been put on hold? Judging by the photos of the dishes you've made, Zov's got nothing on you! Anyway - what I liked about Zov's and dozens of other friends of mine is the simple Chocolate Strawberry Tart. It looks like something so rich and forboding, but amazingly - the way it tastes is so light and makes me not want to share! For light eaters on a budget - just order the side pasta with pine nuts and finish off with the Chocolate Strawberry Tart. It's what my girlfriends do when they want a fast lunch + dessert without the $$$ disappearing from their wallet. If you're a heavy eater though - this combination will not do. I totally enjoyed this blog - gonna bookmark it and also share a link to it from my blog if you don't mind. It was interesting to know from one of the employees that tips at Zov's are not shared with any of the people that actually prepare all of the fancy food. They all get $9/hour without a chance to get a raise or get paid for overtime. I was at Zov's recently and my girlfriend and I had almost the exact same meal you had. I had the lamb while she had the seafood tagine. i thought the lamb was okay the pomegrant sauce was a bit sweet for me but over it was okay. We had the roasted eggplant for the appetizer. It was good until the owner (who was just trying to be nice) came over and showed us how to eat it. He even touched the pita wedges with his fingers. which is the oddest thing any person has done to our food at a restaurant. We didn't eat that piece of pita. Although the meal was okay i thought it was overpriced. i might go back again if we had no where else to go. We tried Zito's grill across the way. Well we didn't really try it. We sat, browsed the menu and walked out. Have you tried that place? What are your thoughts. I haven't tried Zito's Grill. What is it? Sounds interesting!